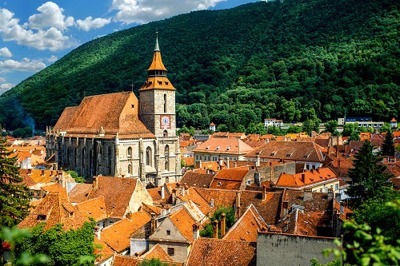 Brasov is ready to amaze its tourists with an instantly compelling skyline! Here they are going to find everything that can astonish a foreigner, such as Soviet blocks, modern entertainment facilities, medieval gateways, Gothic spires, and inspiring nature. But what Brasov visitors notice the first and love about this city, are the lines of street cafes in the bohemian style. Undoubtedly, St. Nicholas' Cathedral, Black Church, Piata Sfatului, Art Museum, Mt Tampa, Old Town Fortifications are a must-see. If you are in Brasov alone or with a group, take some time and guide your guests to one of the street cafes. 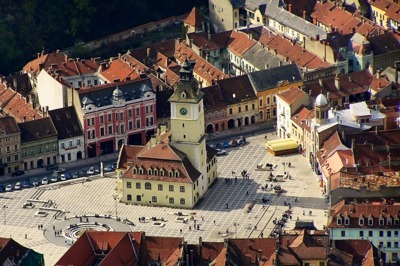 This way you will feel the real charming atmosphere of Brasov and would crave to return again later! Organizing a tour for a large number of tourists is a responsible task. It demands careful planning, a liable approach, and, of course, a reliable means of transportation. Choosing 8Rental as your car rental service in Brasov or any other major European city, you're guaranteeing your guests with safe and comfortable driving experience. Thousands of clients from all over the world trust us once they are heading to Europe. 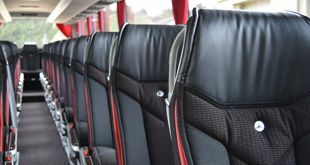 We are the service that can provide you with not only a powerful coach equipped with amazing specifications but also with a professional driver. So, choosing 8Rental, you are making the right decision! Send us a quote and let it prove it to you and to all who are visiting this city! 8Rental is available 24/7 for all its customers. Contact us through email, telephone number, fax or Skype, all addresses are provided on the company's official website. If you are wondering about our pricing system, be certain you're going to be nicely surprised. We don't offer very cheap vehicles. Instead, we offer premium buses with professional drivers, at sensible costs. Besides, the fuel necessary for your whole tour is included in the offer. After you will fill out the quote and get the bill you, will be charged for the services but be sure it will be the precise amount and no hidden fees! Based on the number of tourists you are to welcome in Brasov, you can book either a Mercedes Sprinter or a Mercedes Tourismo. The first model is designed for transporting about twenty-four people. It's a compact, yet a highly convenient model. The second coach, meanwhile, is impressively larger. It's made to accommodate up to sixty-five passengers and provide each of them with comfortable driving conditions. Both models are available in either standard or VIP variants. Which coach to hire in Brasov, depends on the budget you can afford. Hiring a Mercedes Sprinter, your passengers will get a line of amenities involving a carpeted floor, comfy seats, air conditioning, central heating, tinted windows, etc. The standard coach looks pretty nice, while the VIP option is simply stunning! Be sure, you will never regret booking this model as the hours spent on the vehicle promise to be utmost pleasant! 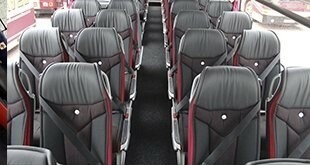 Regarding the Mercedes Tourismo, this bus astounds with its comfort amenities. Here you will find a neat toilet, a mini kitchen with a fridge and a coffee machine, air condition, air suspension, audio system, and a line of other specs. The seats here are in aircraft style for a maximum comfort for the body support. However, if there are still certain additional requirements, feel free to state them in the quote. We shall do everything to supply our buses with what you expect to have. Even though extra features cost additional charging, you will be nicely surprised how affordable our services are! Contact our CS operators to rent a chauffeured bus in Brasov on beneficial conditions. When booking a bus from 8Rental, you are provided with a professional driver. We don't simply offer driving services, we insist on getting a driver for your driving licenses and a professional approach to every client. All our chauffeurs are experts with an impressive practice, local chauffeurs who are well aware of the city roads and can take the necessary direction easily, we also cooperate with drivers speaking English, French, German and other languages. 8Rental did everything so that the communication between our chauffeurs and their passengers is productive and pleasant.